OUR FIRST 50K - DONE! What a GREAT way to celebrate this years worth of training. After training all summer for our first 50Km run, we were remarkably calm the night before, going over maps and packing . Unfortunately, JIM spent a lot of time in the bathroom with the stomach flu! The race started at 8am. It was 5 degrees C and raining. Lubed up and ready to go. It started flat along little muddy trail. Jim and I constantly telling each other to 'slow down'. Only 3 miles into the run I trip-full on mud surf. Good fun. The muddy bog was nice and soft. After a long road of switchbacks we hit some pretty single track trails. Then JIM lost a glove so we ran back to get it cuz another runner saw it. Unfortunately, our good samaritan got stung 3 times! and had to DNF in the end. I'm sure he will be back for more. It happens to the best of them. Feeling great by the time we hit the alpine meadows. The trees were getting scarce so finding a place to pee became a bit concerning at this point. The run down from frostywas a BLAST!! we hit the 27 Km in less than 4 hrs and were feeling great. I found it interesting how you get kinda 'puffy' at altitude. THEN running along lightning lake JIM hits a rock and hyperdorsiflexes his foot and hears a loud 'snap'. We figured he was done... but no, he could run.... with LESS pain in his plantar fasciae ever. So along we go up Skyline one trail. I only had to run back once to get JIM's toilet paper he dropped. He is not done yet! Now Jim is Out for sure! At about 30 Km JIM turns pasty white, is dizzy and severely lacking energy. I figure he was done again ! His stomach flu came back to haunt him. I couldn't just leave him there in the woods... and I couldn't build a rickshaw to carry him down. At 200 lbs, he was too heavy to piggy back. So I conceded to let go of 'competing' and just run behind Jim, letting him set the pace. I had no choice cuz apparently if I ran ahead of him it ''brought him down''. It was hard for me, a real test of self restraint, and a test of our relationship. I thought I dropped a glove and ran back down the hill to look for it. I had lots of time with Jims current pace. I'm thinking I ran more than 50 kms by the end of the race. tee hee. We make it to the 32km Aid station. I inhaled the munchie mix and cheezies! Jim forced down a gel.. and I suggest he refuel with pure water- good choice because he started to get better. Jim digging deep to push the last 20 kms. Me full of energy, having much more fun than Jim at this point. I think my singing 'Peanut butter Jelly time " was a bit annoying for the poor guy. I marked a point on the map- the furthest we have ever trail ran (22 miles). The rest was unchartered territory. Lo and behold Jim perks up AFTER this point and starts running agin- Yippee!! Running along Skyline there are about three peaks. You just think you are done, then you see another peak! 778m climb in total. But the views looking back were again, beautiful. Down,down,down we ran. Me knees were starting to feel it. The 42 km aid station seemed so far. 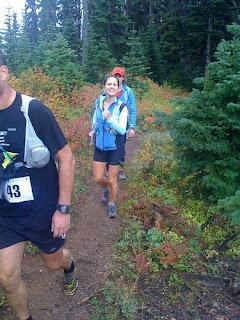 Maybe it was my mindset, but I thought it was hilarous finishing off the race running through a campground ! People sitting all relaxed by their campfire, having a beer, watching 'the freaks' run by. I remember very clearly smelling the hamburger and cheezies a guy had... which he offered to me. I damn near stopped running to sit down with him at his campsite. But DNF'ing ONE km before the end would be just silly, but kinda funny. 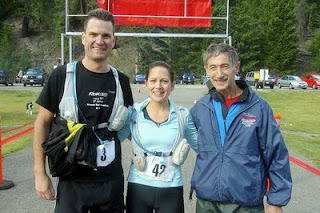 We ran/walked to the finish line to finish at 7 hr 38 mins. 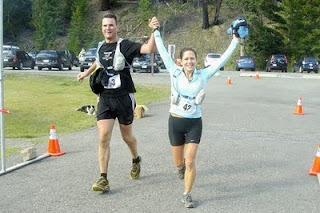 We did the corny thing and 'held hands' when we crossed the finish line. The crowd of 15 went wild. We did it! WE did it!! Nutrition: about 800-1000 cals. Loved my home made date bars at the start, and the carbopro gel at the end. Drank about 4 L of water, and popped some thermolytes. Had to pee, like, 4 times on the run! Jim diddn't go at all for about 9-10 hours... dehydrated or what! I kept hounding him to drink, but his stomach was limiting what he could take in. The pumpkin dessert (made by Gottfried??) went down great at the end of the race. Though I was frustrated with the slowed pace, I now realise it was a godsend. This enabled me to do what I was always envious of other runners.... not to race, but to enjoy the scenery, take pictures, chat with people, make memories . In the end we both FINISHED- that was the goal. I finished feeling fabulous, and feel great the week after... making the whole experience an enjoyable one. 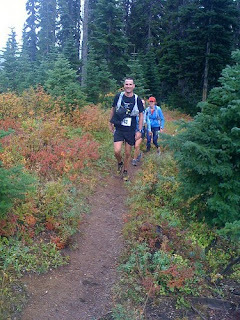 Other runners told me this was hardest 50k they ever did... which gives me confidence for future runs. We are already discussing our next run.. Perfect! Had to Hike 'HEATHER TRAIL" the next day. Looks like a nice run... if I could have actually ran the next day. Yup, I am up late after work. Why? can't sleep. Why?? thinking about my first 50 K run EVER. I know I have trained, I have done several 4 hr and a 5 hr run over the summer. But now the time is nigh.... what to pack, how to rest, etc. With the tapering I have tons of energy. Cleaned the house , did baking, groc shop, and weed eating of a 1/2 acre before noon... then worked till 10:30 tonight. I will try to rest more tomorrow. I just want this to be a positive experience. Maybe lead to more 50 K's..... not one of those 'I'll never do it again' things. So many other people have done multiple 50 Ks and more, so there must be some joy in it. Even moreso, I hope my husband will 'enjoy' it. He is nursing a sore heel, and I hope it doesn't hold him back. I guess we will see.... we will see. FINAL RUNS BEFORE FROSTY 50K. "It is not a race but a celebration of all the hard work you have done"
" It is not the destination, but the journey"
And damn, it has been a great journey training for this. Well, we did our whole 'peaking thing' 3-4 weeks before the run. Two 75 mile weeks (including X-trianing) Much less info out there for specific 50 K trail runs than a marathon, which has Tons of exact guidelines. Even less for the taper- So I'll wing it. Looks like 4-5 mile /occas 6 mile two weeks before, avoiding speed and hill training? -its gonna be hard when you feel great! THIS IS A NEAT PIC FROM THE TRANS CANADA TRAIL ALONG BARNETT MARINE PARK. Very nice trail from Port moody. Apparently we can make it all the way into Vancouver if we get the tides right. Will try next time!! We did Sasamat, Diez Vista, around Buntzen, only part way up power lines then back. At 4 1/2 hrs Jims sore heel made him walk. Pretty damn good for him. Cuz I'm a freak and wanted to run 5 hrs, I finished the rest of the time on the treadmill. It was more of a mental accomplishment than physical. Jim is slowly recovering from his Plantar Fasciitis. Hey, he ran 4 1/2 hrs ! He is finally respecting his injury and decided BIKING is the way to go. "we are NOT buying anything, only looking". I look away for awhile, next thing I see is Jim out with the Credit card buying a Cannondale!! Oh well, He deserves it- he had the same bike for like, 20 years! no kidding! he paid homage to deep cove bike shop big time. So, a great way to finish off our training for our first 50 K was to go and support some great running friends we met this year for their stage race at MARATHON DE SABLES. Friends come and go through life. But there is something about running with someone for 4 hours.... I feel like I know them more than some of my longer term friends- weird. .. Maybe we get bored and open up ?? Hmm... Maybe I should take my daughter for a run! I am looking forward to meeting more crazy runners. Since we were actually home Sunday morning . (shorter run-taper thing ) We got to see these four bears, plus a fifth. All enjoyed our crabapple tree immensesly. Entertainment every year.! I guess the next post will be the actual run... yikes! Afraid... but Very alive.